In this July 17, 2012 file photo shows Chinese fishing vessels anchored at Fiery Cross Reef (Kagitingan) on the disputed Spratly islands. Vietnam said it resolutely opposes a temporary Chinese ban on fishing in the Gulf of Tonkin, the latest in a series of sovereignty disputes in and around the South China Sea. China’s ban came as the neighbors seek to patch up ties since a row in May last year when China deployed a $1-billion oil rig in waters claimed by Vietnam. That led to confrontation at sea and violent anti-Chinese protests in Vietnam. China’s May 16-Aug. 1 fishing ban violated international law and Vietnam’s sovereignty and jurisdictional rights, Vietnam’s foreign ministry said in a statement on its website. 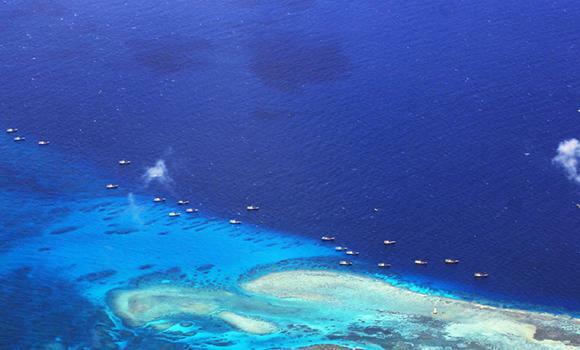 China introduced the annual ban in 1999 “to promote the sustainable development of the fishing industry in the South China Sea and protect the fundamental interests of fishermen,” according to its state news agency Xinhua. Authorities have threatened violators with fines, license revocations, confiscations and possible criminal charges. China and Vietnam have overlapping claims to large parts of the South China Sea and various islands and reefs. Tension rose in 2012 and 2014 after China detained several Vietnamese fishermen in disputed waters. Both sides accused the other of intimidation and ramming vessels.